Apex Indoor Sports is committed to protecting any personal information that you provide to us. In particular, we believe it is important for you to know how we treat information about you that we may receive from this website. In general, you can visit this website without telling us who you are or revealing any information about yourself. Our web servers collect the domain names, not the e-mail addresses, of visitors. Our web servers also seek (as many websites do) to place a “cookie” (a small data file) on your computer’s hard drive which allows the server to identify the computer when it visits again in order to track statistical information about navigation to and throughout certain areas of our site and to promotions on other sites. This cookie is not used to obtain your name or any personal data. The information that is tracked is used only for internal purposes, such as to improve site navigation and to measure the effectiveness of our promotional placements. It is not shared with anyone other than Apex Indoor Sports affiliates and contractors who assist Apex Indoor Sports in these efforts and who are bound to confidentiality. However, if you prefer not to accept cookies, you can set your browser to reject them or to alert you before one is placed. We use a third-party technology to place our advertisements on other websites. This technology will install a small “cookie” file on your computer when you view our ad. These cookies will not contain any information that personally identifies you (such as your name or e-mail address) but they will contain a randomly generated number that is unique to your browser and can be recognized by a “Web beacon” (transparent GIF file) on our site if you click through to our site from one of our ads. This allows us to keep track of how many unique visitors we have to our site and from what ads they entered, so that we can measure the effectiveness of our ads and ad placements. The privacy policies of the websites on which we advertise, and through which the cookies are installed should inform you about the cookie, and you may of course set your browser to reject cookies. To learn more about the third-party ad-serving technology that we use, cookies, and how to “opt-out,” please email info@apexindoorsports.com. By submitting a request form on any of the Apex Indoor Sports web properties or online offers, I authorize Apex Indoor Sports or their affiliates to contact me by telephone and/or email in respect to this offer and any new offers made available in the future. When other information is collected from you, such as your name and e-mail address, we generally let you know at the time of collection how we will use the personal information. Usually, we use the personal information you provide only to respond to your inquiry or to process your request (such as to receive information about our services). This information may be shared with other Apex Indoor Sports businesses, but only if necessary to fulfill your request or for related purposes. If you call a telephone number listed on our website, we may collect Personal Information from you, including your name and telephone number through caller identification and reverse call technology. We also may record the telephone conversation. We record the telephone conversation to track the performance of our advertisements and for quality assurance purposes. We do not record the calls for the purpose of collecting your Personal Information. If we record the telephone conversation, we will notify you before the conversation begins. In addition to Apex Indoor Sports, the only parties that have access to the recording are the telephone service provider and Apex Indoor Sports contractors and affiliates who assist strictly in the efforts described in this paragraph, and who are bound by confidentiality. By providing my contact information and telephone number, I expressly authorize Apex Indoor Sports or their affiliates to contact me at the telephone number that I have provided and/or the email address that I have provided, even though I may have previously chosen to have the telephone number that I provided or the email address that I provided added to any Do-Not-Call List or anti-spam list including the lists maintained by Apex Indoor Sports or their affiliates or any local, state, or federal government agency. 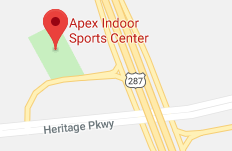 I further acknowledge that by submitting this request, Apex Indoor Sports or their affiliates have my permission to contact me via telephone and/or email. Apex Indoor Sports’ website may contain links to other sites. While we try to link only to sites that share our high standards and respect for privacy, we are not responsible for the content, security, or privacy practices employed by other sites. We maintain strict physical, electronic, and administrative safeguards to protect your personal information from unauthorized or inappropriate access. We restrict access to information about you to those Apex Indoor Sports workers who need to know the information to respond to your inquiry or request. Workers who misuse personal information are subject to disciplinary action. Creation, Migration and Use of User Lists. Apex Indoor Sports must have all rights necessary to create or otherwise obtain User Lists, migrate User Lists to, and use User Lists on, the Google Display Network. Google will not allow another advertiser to use your User List without your consent. Selection and Targeting Restrictions. Apex Indoor Sports may not use User Lists to select or target advertisements (i) based on past or current activity by Users on adult or gambling sites, government agency sites, or sites directed at children under the age of 13 years or (ii) based on other inferred or actual sensitive information (including without limitation, health or medical history or information, financial status or other detailed information pertaining to a person’s finances, racial or ethnic origins, religious beliefs or other beliefs of a similar nature, the commission or alleged commission of any crime, political opinions or beliefs, trade union membership, or sexual behavior or orientation). PII Restrictions. Apex Indoor Sports may not, for the purpose of serving Ads, directly associate and store personally identifiable information (“PII”) with the User Cookie without robust notice of, and the User’s prior affirmative (i.e., “opt-in”) consent. Advertising Cookies Policy. Apex Indoor Sports’ use of the User Cookie via a User List is subject to this Interest Based Advertising Policy and the Google Advertising Cookies Policy. Google’s use of User Lists is also subject to this Interest Based Advertising Policy and the Google Advertising Cookies Policy. DoubleClick Boomerang and User List Services. Apex Indoor Sports may not use a User List created via DoubleClick’s Boomerang or User List services on the Web Properties unless the sites from which those User Cookies were compiled (i) properly discloses the data collection and usage contemplated by this Interest Based Advertising Policy and (ii) complies with the privacy and notice requirements of this Interest Based Advertising Policy. User List Transparency. Apex Indoor Sports grants to Google the right, should Google elect to do so, to display to any User that is part of Apex Indoor Sports’ User Lists that the User is on at least one of Apex Indoor Sports’ User Lists, along with displaying Apex Indoor Sports’ domain or display name. In Ads Notice Labeling. Google may also, should Google elect to do so or should Customer request Google to do so, label advertisements served based on User Lists with notices or overlays intended to advise Users that the advertisements are based on User Lists, and Apex Indoor Sports may not modify or obscure these labels. Conflicts. If Apex Indoor Sports is using third-party ad serving in order to serve Interest-Based Advertisements, then Apex Indoor Sports needs to comply with both the Third-Party Ad Serving Policy and this Interest Based Advertising Policy. To the extent there is any conflict between this Interest Based Advertising Policy and the Third-Party Ad Serving Policy then Apex Indoor Sports needs to comply with the version of the conflicting provision in this Interest Based Advertising Policy.